(Newser) – President Trump is now openly feuding with Stephen Colbert, and the Late Show host is loving it. Colbert opened his monologue Thursday by reading quotes from Trump's Time interview, in which the president called Colbert a "no-talent guy," the Washington Post reports. 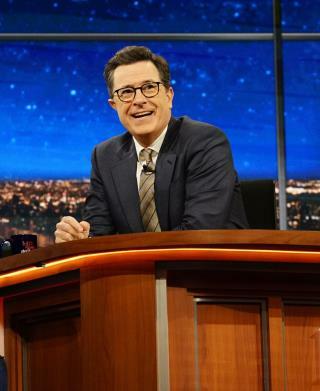 "The president of the United States has personally come after me and my show," Colbert told the audience. "And there's only one thing to say: Yayyyy!" He mocked Trump for failing to understand show business, saying he had been trying for a year to get Trump to say his name. "But now you did it," Colbert said. "I won." After a careful look and consideration at events, it seems to me that fascism is already here in the United States. True, it hasn't done yet what fascism is known for. Fascism, however never does anything it does not need to do. A large body of Donald supporters are oppressing themselves. That keeps the veneer of democracy intact here. Once a critical mass becomes too restless the monster will rear its ugly head to do "whatever is necessary" to quell that restlessness. No, he didn't win. And Trump has normal looking ears, unlike Colbert.